There are many places to learn ballet or take ballet class. When you first start out, of course, it is good to give every possible class a try. There are many factors to consider when you start to commit to a class. For most beginners, schedule and location (and sometimes cost) is probably the top priority. However, as you progress, factors like type of teaching, who is teacher, or studio flooring, type of class, opportunities to perform, the number of students in each class, become more important. Ultimately, everyone decides based on their priorities for ballet. There is no wrong or right way to choose the right ballet class for you because everyone has different priorities. I can only share with you how I choose my ballet classes. These are in no particular order or priority. I will later share about my personal preference. As adults, we all have varied and busy lives. It has to fit our schedule. Thus, what you can do is set aside time for class, for instance, I can dance Monday, Thurs nights and Saturday mornings. Then look for classes in your area that fit those times. If ballet becomes higher in your priority, you may find yourself adjusting your schedule to the classes you want to take. Though it is increasingly convenient for us to take class, I’ve noticed that people in my country wouldn’t travel for more than 40 minutes for a class. I’ve traveled up to an hour for each class but I stopped especially for a class I think that is not that worth my time. This is especially for a 1 hour class, the studio flooring and teaching is not that good. Plus, if I did take this class, it would take me 3 hours of my time, 1 hour class + 1 hour there and back. The teacher has to be really good for me to consider travelling really far. Teaching method differs. Some teachers focus on posture, some tend to focus on expression, some placement, and others position, muscles, musicality and other technicalities of learning ballet. They are all important. However, some may be more important than others depending on what stage you are in learning ballet. Other teaching styles includes a more encouraging atmosphere, a fun environment, or serious and strict style. You may blossom under one teacher or feel down and out with another….it really depends on your learning style. Generally, teacher that gives you personal corrections are the best. That is of course, unless the teacher is not that good or is sloppy. Some teachers are deemed really good that students follow them, even if they switch studios or schools or even levels (beginners/intermediate/advanced)! If that works for you, why not? If you feel that you really enjoy the class or you really progress, this is a good thing. I have two teachers that I follow. 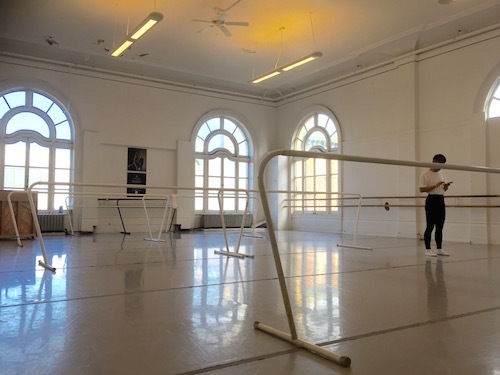 Some studios are really slippery (and you can carry a small bottle of rosin for that), some are not sprung floors, which I feel are important as you progress – because you’ll be doing more jumps and even pointe work. Those are harmful for the knees if the studio does not have a sprung floor. Other studios may not have sufficient space, either they are too small or they are too small because there are too many students. It can be frustrating to dance in a too small studio. I’ve known some friends who dance at the big open studios but take one class per week at a small ballet school. This is so that they get to participate in the year end concert. Eventually I did that too. Performing is something hard to describe unless you have done it before. As adults, we rarely get this chance to unless we have convince our church/workplace to let us put up a dance at events. One of the ways to get a chance to perform is through your ballet school/studio. In general, less students is better because you’ll get more attention, space etc. However, sometimes the teacher is worth squeezing in the class for. When I first started, I went for lots of open classes. These are usually adult ballet classes. It is rare to see anyone younger than 16 and if there are some of those, they are probably practicing learning combinations or doing extra conditioning for their bodies for an exam/performance, OR that their usual studio/ballet school is closed for the holidays. These classes are good to perhaps introduce you to ballet, learning its terms and steps. It may be a less intimidating environment because almost everyone is a beginner. It is also a less intimate situation where you can just walk in, pay for class, not build any relationship with anybody and walk out if you don’t like the class. That ‘invisibility’ may make it less intimidating to get started to learn ballet. After a while, as I progressed, I realized I could progress faster through a small studio (and private lessons). Though this is less flexible for the busy adult, it forces you to make a commitment to going to class, even when you’re feeling lazy. This crucial to your progress in learning ballet. Also, because as your classmates are term-payers, you’ll see the same people in class again and again. You’ll learn to build a good working relationship in terms of progressing together. Not to say that it isn’t competitive, but most likely in a good way, especially when everyone is grown up and mature, and that can give extra motivation to work harder in class. If you have progressed, but because of the new faces in class each week the teacher has to slow down and not teach new steps because of them, you won’t be able to progress either. 4. Opportunities to perform + to learn repertoire. Ballet, after all is a performing art, and if you’re in a small studio, you’ll most likely be roped in for the studio’s year end concert. In this way, you’ll get to learn repertoire, which are experts from Swan Lake, Coppelia, Sleeping beauty – modified versions but no less, you’ll gain a greater appreciation for these classic ballets. And the next time you watch Swan Lake performed by the Royal Ballet or Bolshoi, you’ll gain such a familiarity with the steps and the music, that you’ll be able to enjoy it at a much greater and sophisticated level. You most probably won’t get to do this in a large impersonal studio. While ballet class is not social hour, for many of us, it is in some sense. It is the highlight of our week, where we go and de-stress, enjoy, have fun, see friends! Relationships can be built among your friends. You have a common interest and share tips, ideas and help each other other in stretching or with a difficult step. You may all go together to watch the ballet as well! This is still achievable in big open studios, especially if you notice who are the regulars (as yourself) and eventually friendships are formed. Of course, it’s best not to chat to your friends during class because it is not good ballet classroom etiquette and disrespectful to the teacher. It is also not conducive to your learning. I hope reading this article will help you pick the right ballet classes for you!